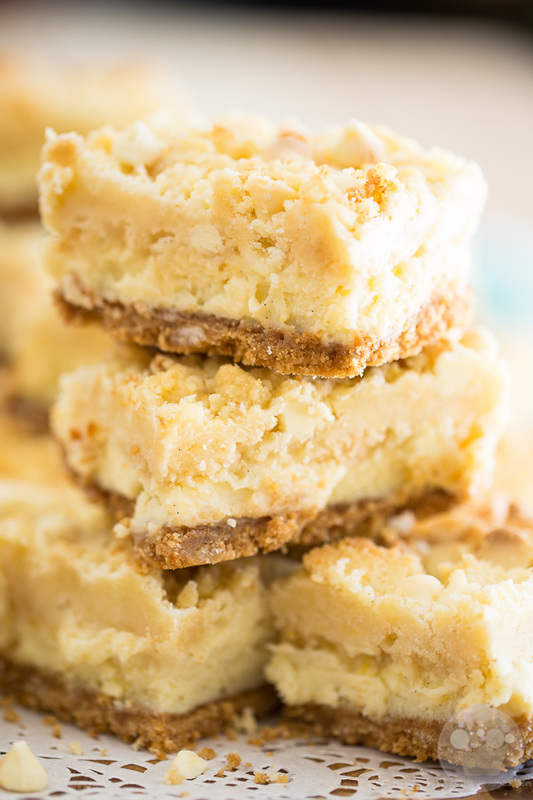 These White Chocolate Lemon Cheesecake Bars are perfect: a super silky cheese filling trapped between a graham cracker crust and soft crumbled cookie layer. 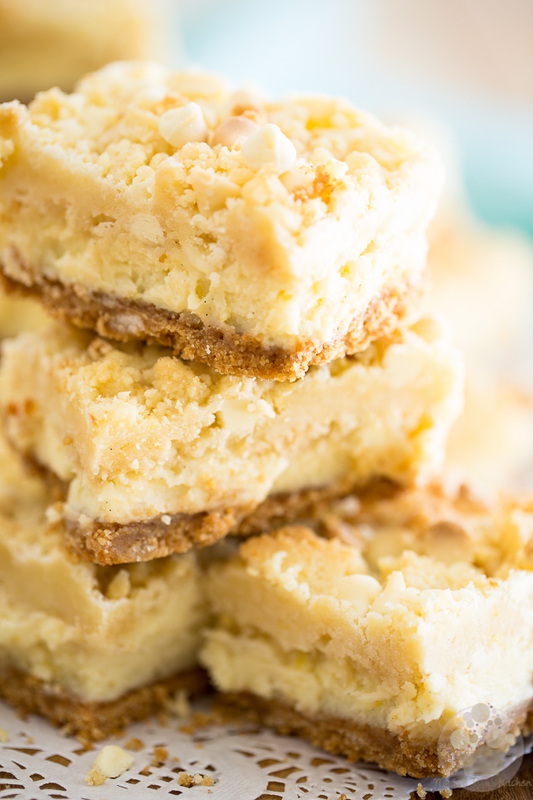 You will forever bless the day you came across the recipe for these White Chocolate Lemon Cheesecake Bars. I am totally not kidding: long before you even get a chance to grab a bite from one of these babies, they will already have your brains doing backflips and drooling all over your self-control. 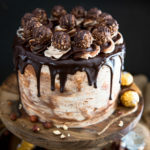 Indeed, the intoxicating smell that emanates from the oven as they bake is so heavenly, you’ll think you’ve suddenly found yourself catapulted to a beautiful place somewhere above the clouds and that you are sitting on one of those light balls of cotton, surrounded by a choir of angels singing in perfect unison. 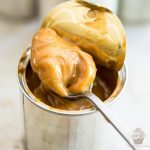 And then, at one point, the smell will be so exhilarating, you won’t be able to take it anymore; you’ll probably find yourself wanting to breakdance across the kitchen floor! That’s how good they smell… Now can you imagine how great they taste? 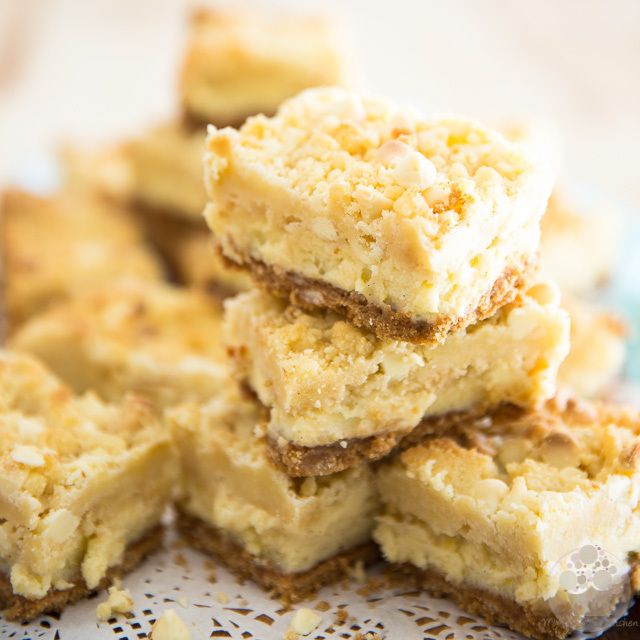 Let me try and give you an idea: these bars, they’re so crazy tasty and amazingly delicious, you’ll want to pretend that they’re a bar of soap so that you can rub them all over your skin and cover your entire body in their tangy, lemony sweetness. 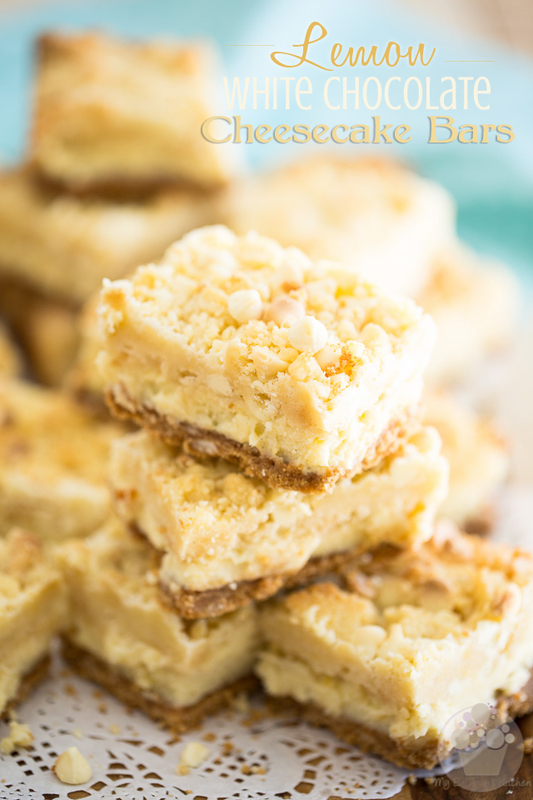 Everything about these bars is flawlessly perfect: I can’t even begin to describe how impeccably the tanginess of the lemon gets tamed by the delicate sweetness of the white chocolate, and how well the creaminess of the cheese filling contrasts with the slight crunchiness of the graham cracker crust and soft chewiness of the top cookie layer. 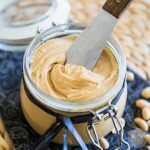 The addition of melted white chocolate to that cheese batter really makes it ultra rich and creamy, too! 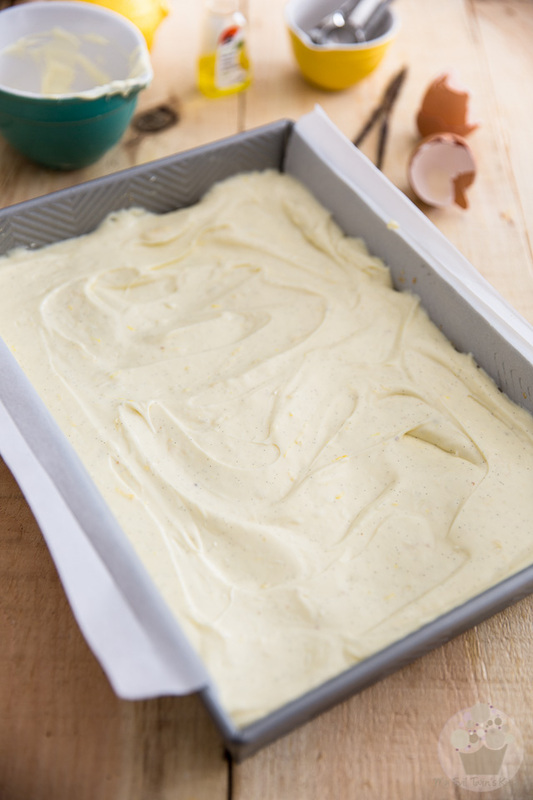 Then of course, you get a little bit of sweet and salty action going on… like just the perfect amount. Oh, I wish I could find the words to tell you just how utterly PERFECT these are. They are without a doubt one of the best things that I’ve eaten in my entire life, and I really do mean that! They simply taste like paradise. 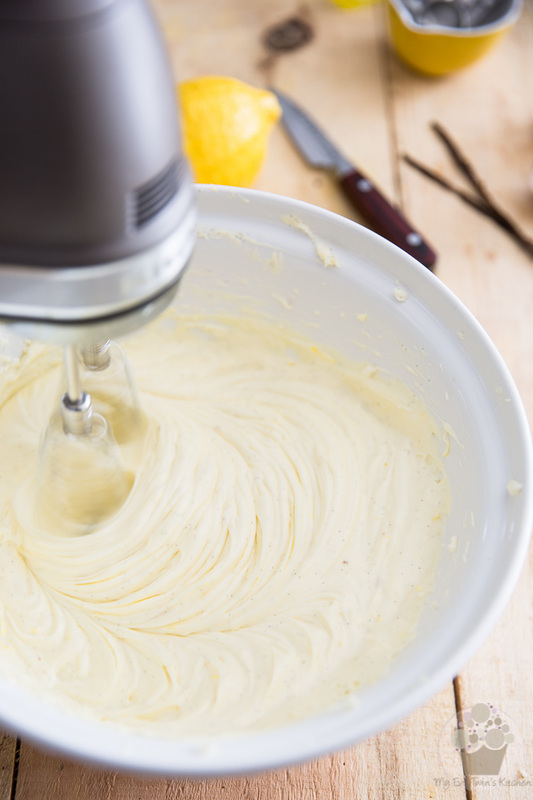 Do yourself a favor, make a batch right this minute. 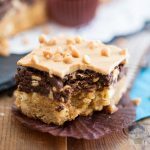 And don’t you dare cutting it in half; you would sorely regret it… Besides, these bars freeze perfectly well, should you feel the need to save some for later. Honestly, though? I doubt that will happen! 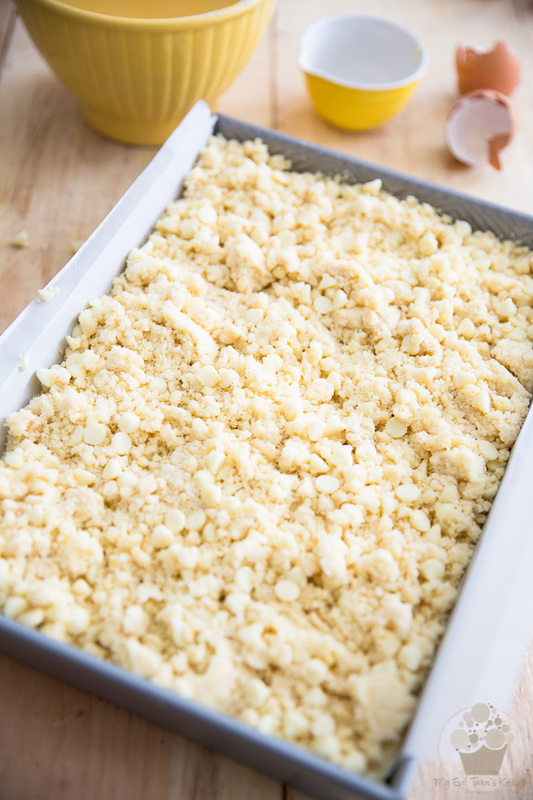 Grease and line a 9″ x 13″ baking pan with parchment paper, leaving a bit of an overhang on either side, which will make it much easier to remove the bars when we are ready to slice them. 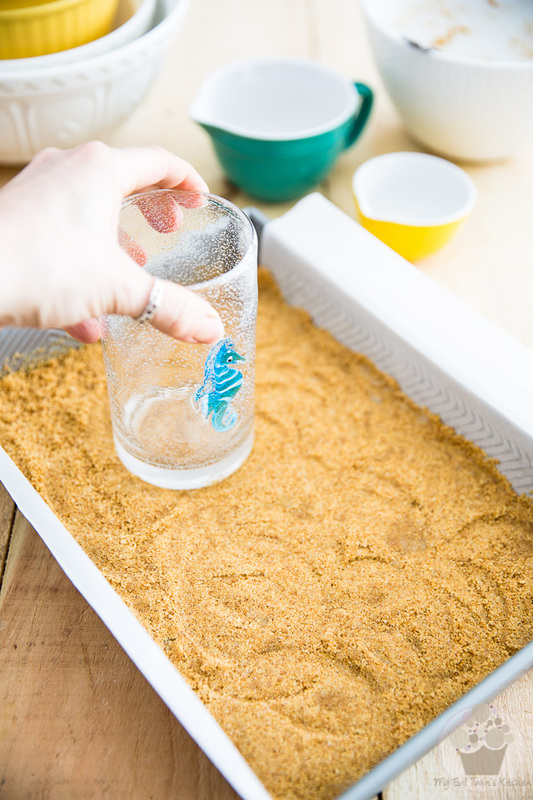 Combine the graham cracker crumbs, sugar and melted butter in a large mixing bowl. Mix until well combined and transfer to the prepared baking dish. Press the graham cracker crust firmly into the bottom of the pan. I like using a glass to do that, but your hands would work just as well. Just make sure that you press that crust firmly and evenly across the entire surface of the pan. 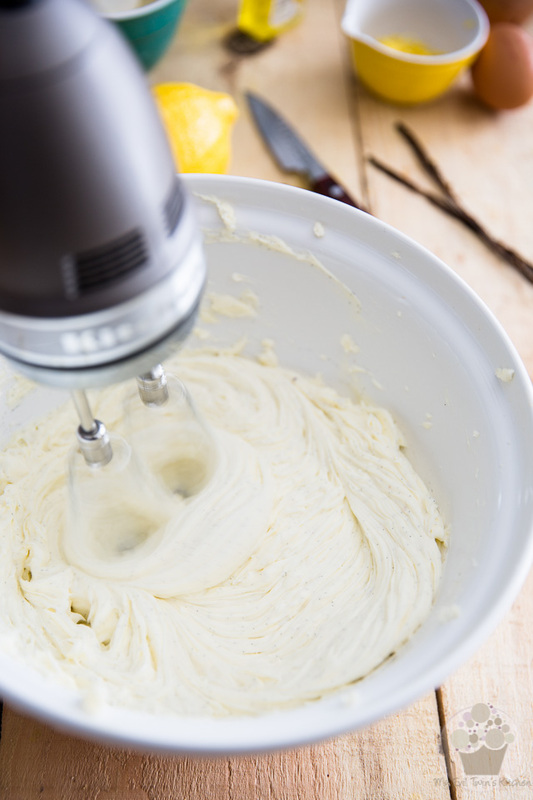 Beat the cream cheese, sugar and vanilla seeds with an electric mixer until well combined and smooth, about 2 minutes. If you didn’t have any fresh vanilla beans, you could always use good vanilla extract instead, but you would be missing out on the elegant and distinctive little black specks that the vanilla seeds contribute to this wonderful cheese filling, a sure sign of quality! Plus, the flavor of fresh is simply unparalleled. I strongly recommend you go for it, if you can! 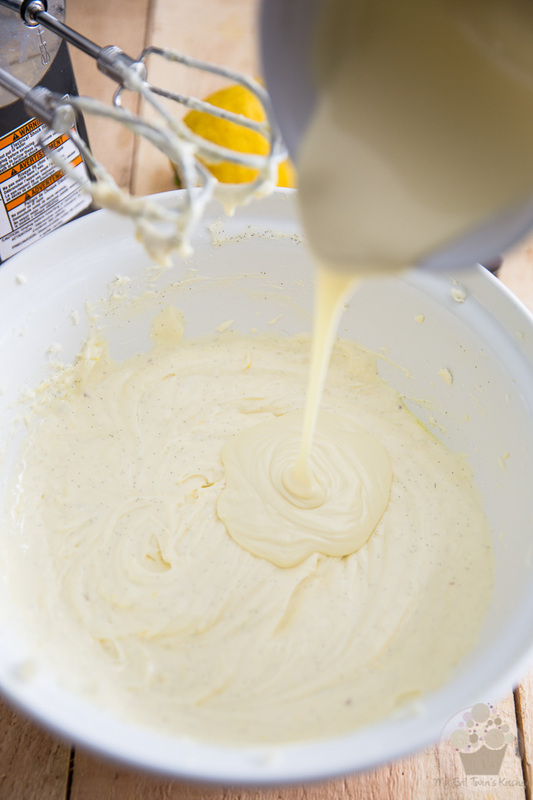 and then resume beating until the mixture becomes light and airy, about 2 minutes. …and quickly beat it in until well incorporated. It’s preferable that you act fairly quickly here. So don’t go answering the phone or the door while that pool of white chocolate is sitting there. 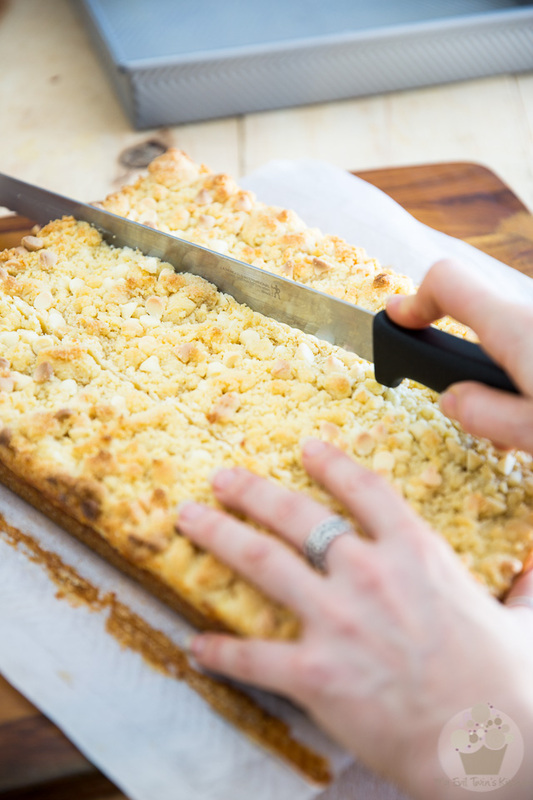 …and delicately spread it all the way to the edge with a rubber or offset spatula. 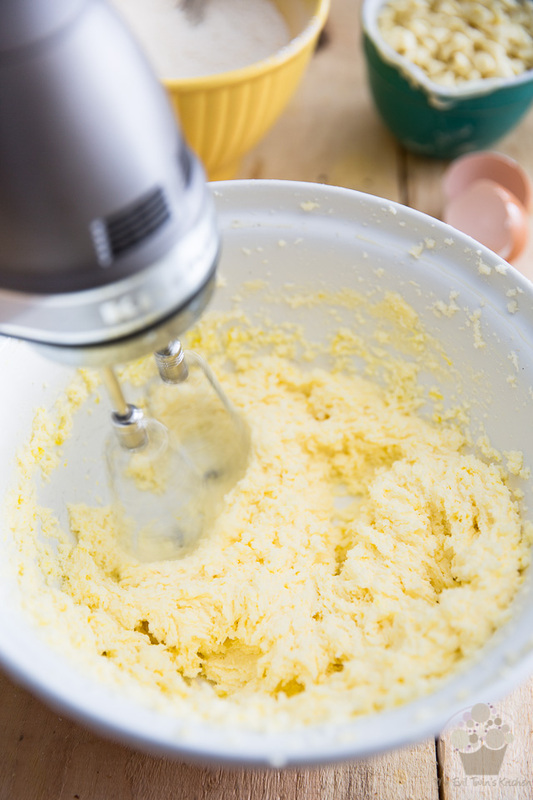 Beat the butter and sugar on medium speed for about 2 minutes, then add the eggs, vanilla and lemon extracts and lemon zest. Resume beating until combined, about 1 minute. 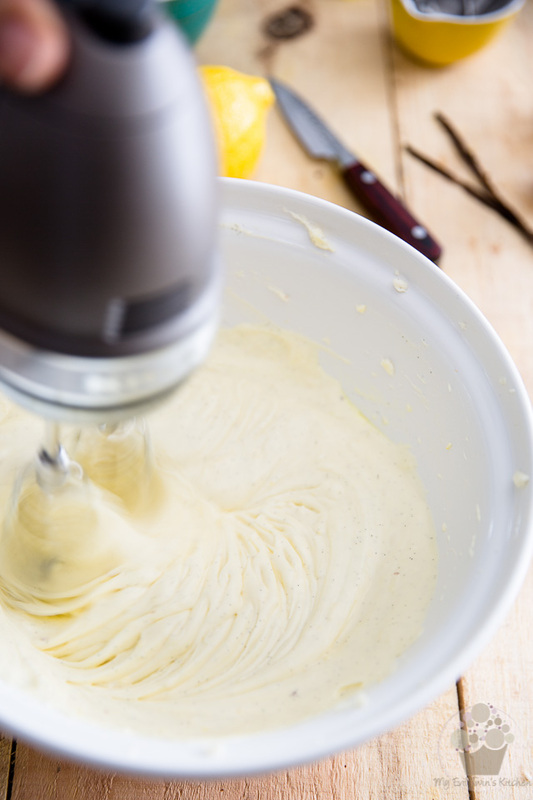 Don’t expect this mixture to become smooth and fluffy because it won’t. In fact, you will find that it remains sort of grainy and thick, with a slight tendency to separate. That’s perfectly okay. 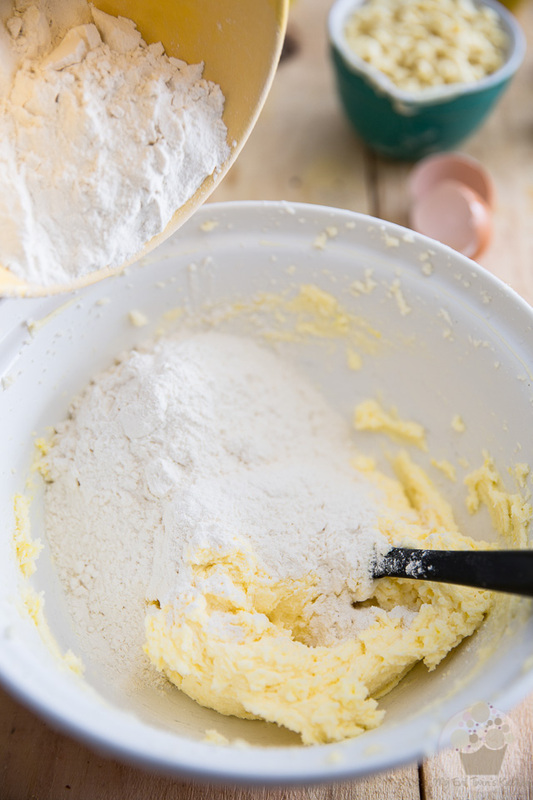 In another large bowl, mix the flour, baking powder and salt together and then add them to this butter mixture. Beat on low speed until all the ingredients are well combined but resemble very coarse sand or gravel. 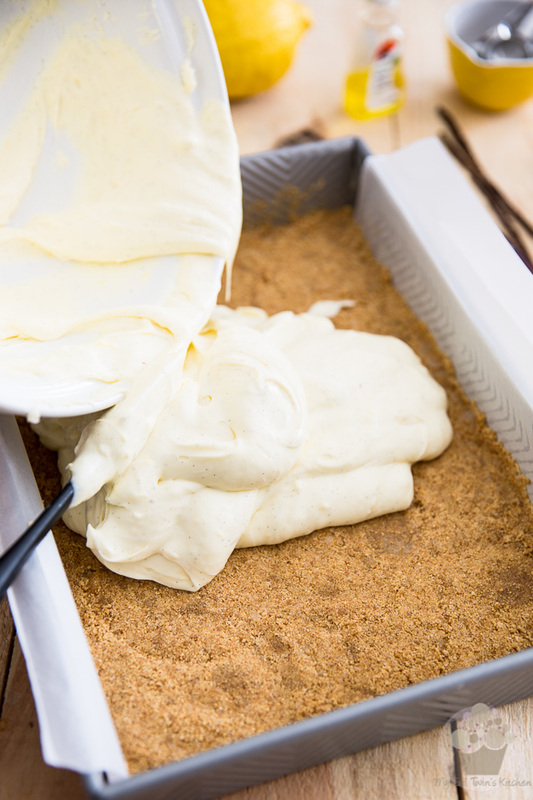 And then drop the dough by large spoonfuls right on top of the cheesecake layer. Spread gently with your fingertips until the entire surface is covered. Bake the bars for about 30 minutes, or until lightly browned, then allow to cool completely in the pan. Yes, I’m serious. I know that by this point, the house is smelling insanely delicious and you’re probably losing your mind. All you want to do is have one of those heavenly smelling things that just came out of your oven. Or maybe, you’re even thinking that you could sit yourself down with the entire pan and eat it with a spoon, while no one’s looking. But trust me, you don’t want to be doing this. First off, these babies will slice MUCH better when they’re cold (in fact, they won’t slice well at all while they’re still warm, so you shouldn’t even attempt it, unless you are wanting to eat white chocolate and lemon cheesecake crumble), and segundo, their flavor is like a million times greater when they are chilled. For realz! About that slicing, I find that a long serrated knife works best for this job. 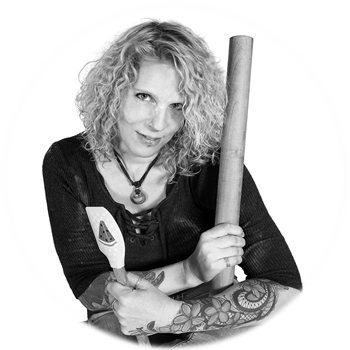 Rather than pushing on the knife, hold it horizontally against the bars and gently saw your way through the layers, while supporting the bars with your other hand. 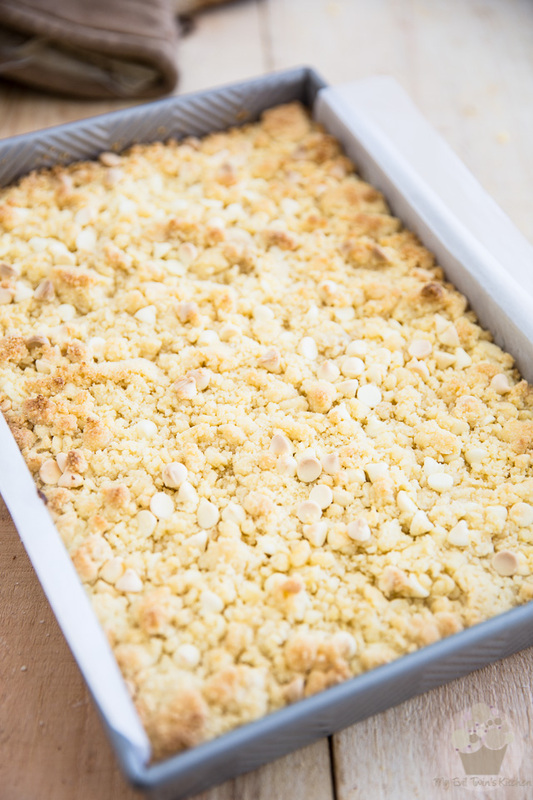 Cut one entire row of at a time and then cut each row separately into individual cookie bars. You can sit yourself down and enjoy a moment of pure bliss, thinking that you have about 17 to 23 more to come! I’m just kidding, of course. Go make those bars, and make some friends! Grease and line a 9" x 13" baking pan with parchment paper, leaving a bit of an overhang on either side for easy removal of the bars. 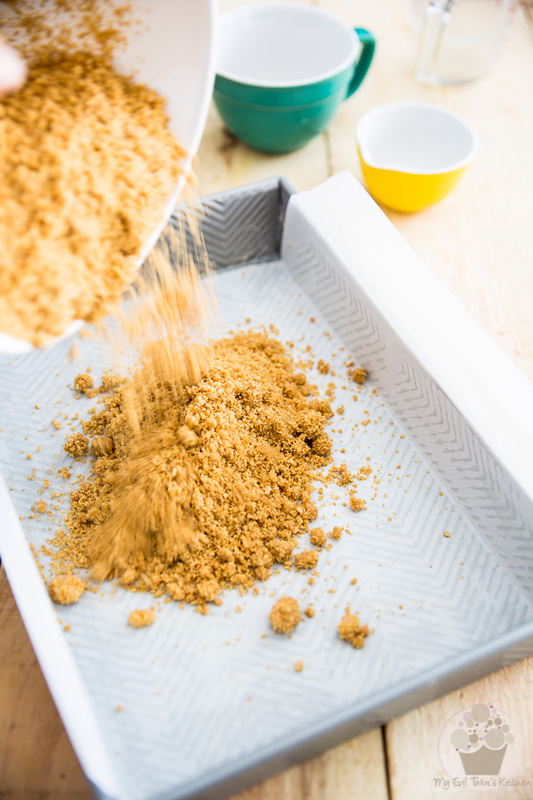 Combine the graham cracker crumbs, sugar and melted butter in a large mixing bowl. Mix until well combined and press this mixture firmly into the bottom of the prepared baking pan. Set aside. 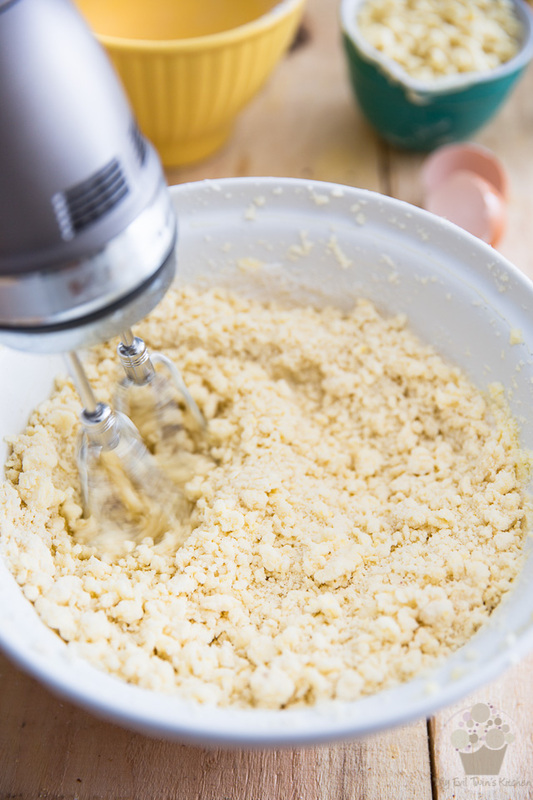 Beat the cream cheese, sugar and vanilla seeds with an electric mixer until well combined and smooth, about 2 minutes. 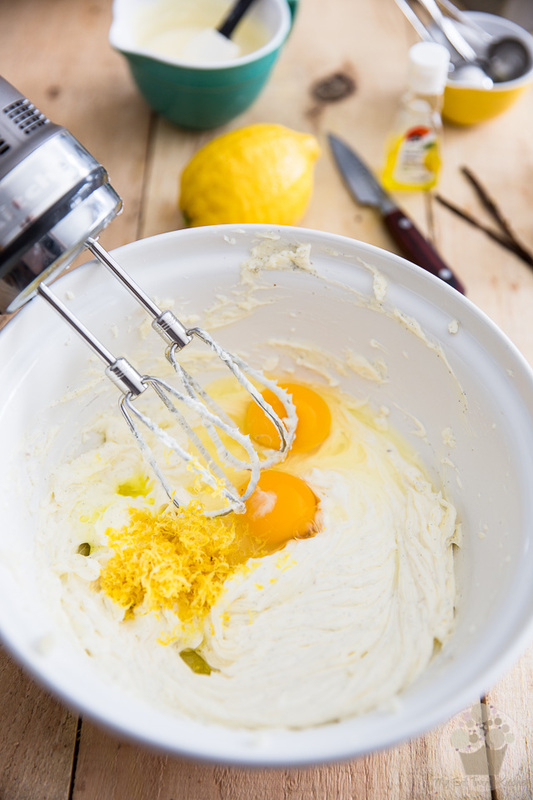 Add the eggs, lemon extract and lemon zest and resume beating until light and airy, about 2 minutes. 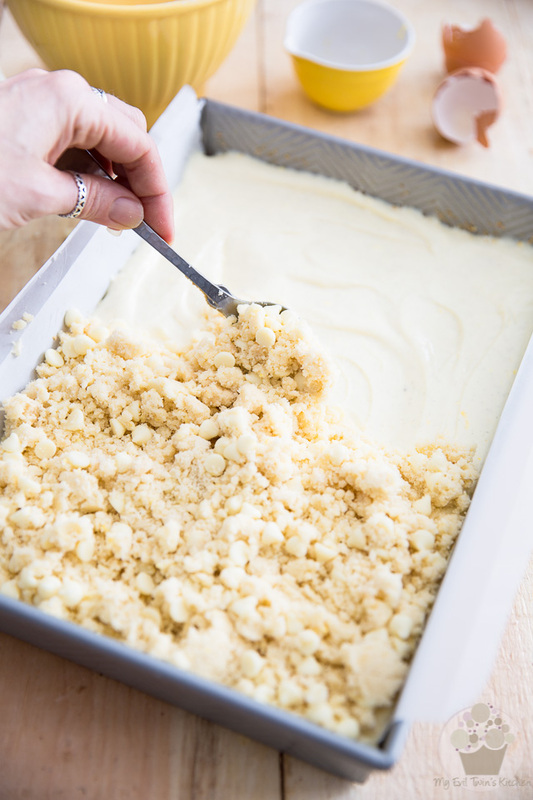 Finally, add the melted white chocolate and quickly beat it in until well incorporated, then pour this filling over the reserved crust and spread all the way to the edge. Set aside. 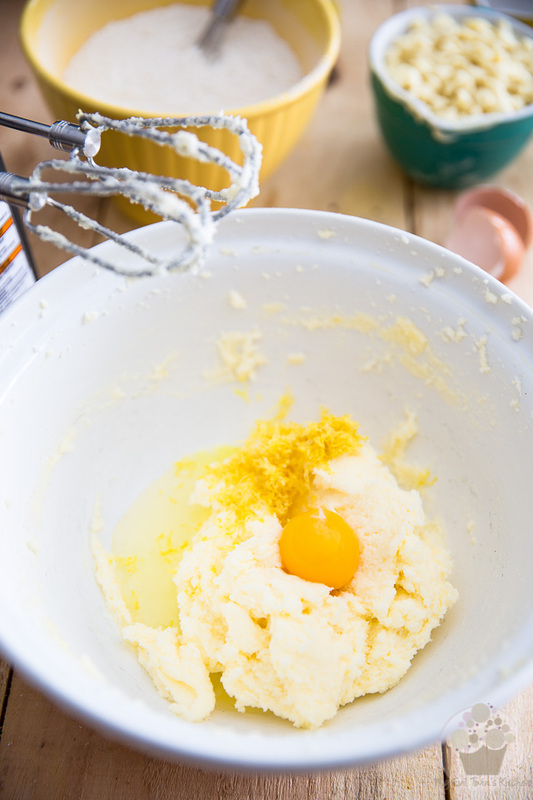 Beat the butter and sugar on medium speed for 2 minutes, then add the eggs, vanilla and lemon extracts and lemon zest and resume beating until combined. 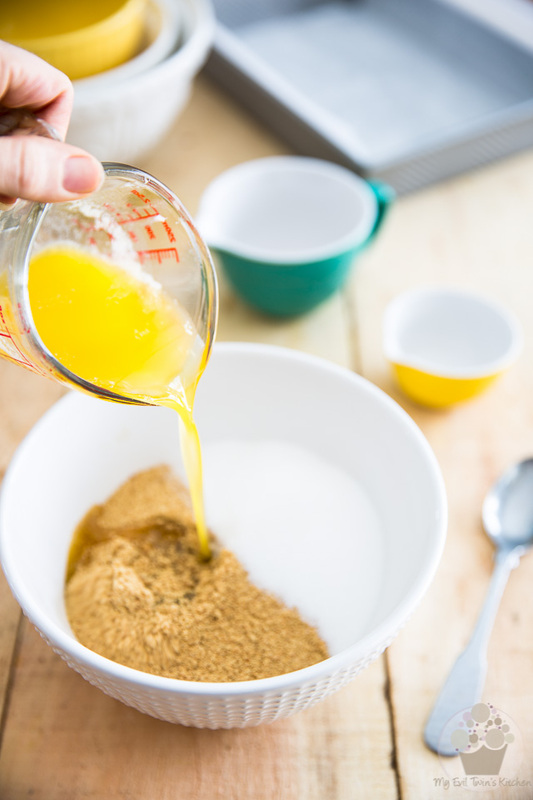 Mix flour, baking powder and salt together in a large bowl and add to the butter mixture, then beat on low speed until the mixture is well combined but resembles very coarse sand or gravel. 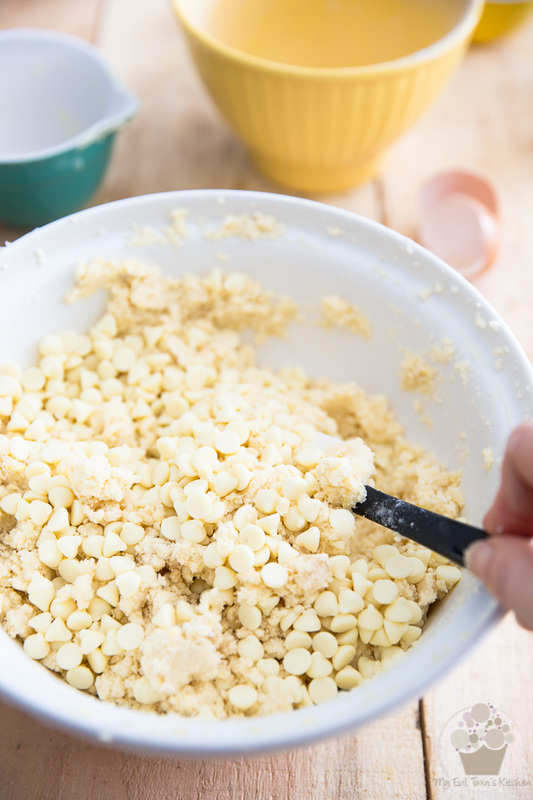 Delicately fold in the white chocolate chips. 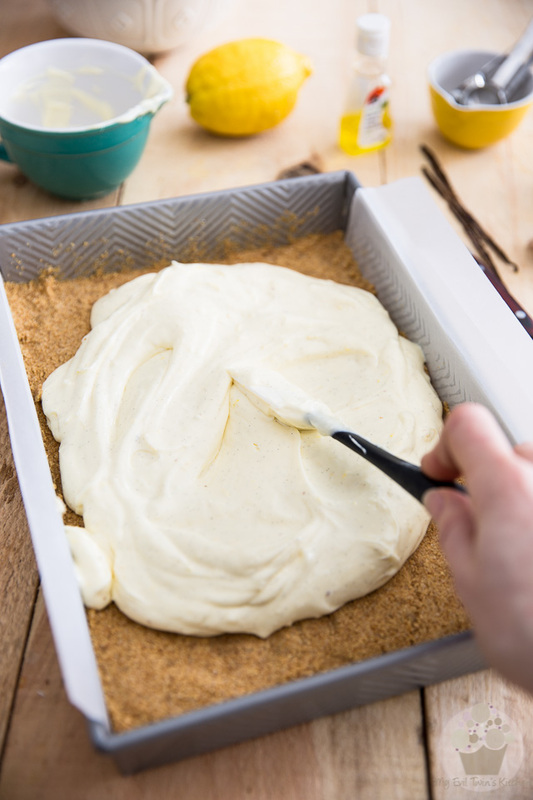 Drop the dough by large spoonfuls onto the top of the cheesecake layer and then spread gently with your fingertips until completely covered. Bake for about 30 minutes, or until lightly browned, then allow to cool completely in the pan. Refrigerate for at least 4 hours or better yet overnight, then remove from the pan, slice and serve cold or at room temperature. Hahahaha! If you’re gonna have an evil treat, Jordan, this might as well be it. I swear, your life will never be the same and you will probably curse my name for eternity, but I can live with that, for it will not be in vain!